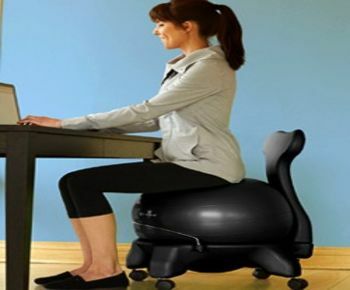 If an individual spends most of his or her day sitting, normal chairs for example office chairs in many ways have negative effects on the posture especially if such person does not sit in the chair properly. If a person slouches constantly in his or her chair, there may be a gradual reduction in their core strength which of course is not a good thing. All hope is not lost however, replacing the chair for an exercise chair ball could do the magic of helping such person. Are you this kind of person? You are wondering if exercise chair balls have any kind of benefits that come with them if used in place of normal chairs? Of course they do. On an exercise chair ball, most of the time you will spend sitting in it would be spent trying to maintain a balanced sitting posture so unconsciously and irrespective of what you are doing, your body automatically sits correctly. Whatever strain you may have been feeling in your back or core would be relieved this way. Other than this single benefit, we will be discussing other benefits that come with using exercise chair balls in this article. Using an exercise ball chair definitely helps you get rid of extra calories. There is no way you would sit on a ball chair and not move. Unconsciously, in the bid to maintain a balanced sitting posture, you tend to move your body from time to time and this body movement helps your burn more calories in your body. Of course you know the importance of getting rid of calories in the body right? We have pointed out the negative effects of normal chairs on the body and your core strength and how switching to an exercise chair ball can correct those effects. The truth is, with normal chairs, every time you sit down, you have to rest your back against the back of the chair. But with an exercise chair ball, you have to engage your core there is nothing for you to rest your back on. You will be able to engage your cores and tone your abs which brings about an increase in your core strength. Normal chairs have a way of preventing full circulation in the body. Even research has shown that people who are 45 years and older who sit for about 11 hours or more every day have a 40% chance of dying quicker that those who sit for four hours or less. Sitting on an exercise chair ball on the other hand enables circulation in the body. Switching position every now and then combined with a couple of bouncing will surely get your blood pumping and circulating more freely. What better way to ensure you live a longer life? Get an exercise chair ball today. There are lots of proofs that attest to the fact that being physically active keeps the brain active which brings about better performance. This is perhaps why when you are experiencing a block in solving a problem, it is usually helpful to walk around a little bit.